Slatewood is a tremendously versatile material due to its inherent technical characteristics. The highest grip / non slip ratings possible, plus its extremely high flexural strength makes Slatewood an excellent choice for exterior flooring or paving, garden steps, retaining walls and of course many other uses including borders. As a cladding option, its spectacularly grained faces are unique, which other product has the beauty of old timber yet is an ultra durable natural stone? Its very high flexural /bending strength makes Slatewood ideal for retaining walls and raised beds. Why Slatewood and not timber sleepers or concrete or sandstone or even limestone ? Slatewood will not rot or burn. It is a well known fact that most if not all the reclaimed railway sleepers are contaminated with carcenogenic creosotes, oils and so on. 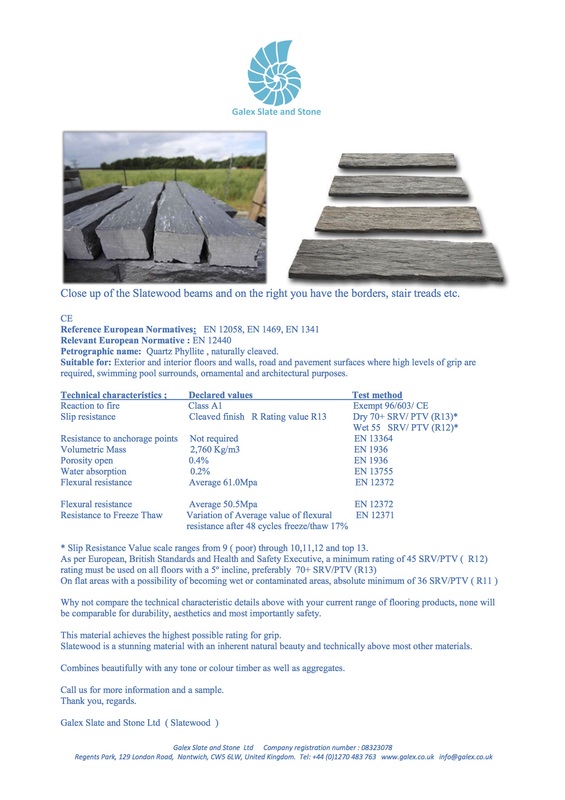 Compared to concrete, sandstone, limestone and many other materials, Slatewood has various distinct advantages, firstly the water absorption ( 0.2% ) is far, far lower than any of the afore mentioned and as a result Slatewood will not absorb algae and lichens as is the case with the majority if not all the other materials. Flexural resistance ( bending strength ) is important for paving, steps and retaining walls, in this field Slatewood also proves to be excellent, with rating of over 60Mpa and 50Mpa after 48 cycles this is considerably higher than the competition with the exception of timber.